Udo on the chopping block. This post first appeared in June, 2012 at Ecotwaza.com, a lovely little company here in Japan sharing the best of Japanese culture, where I used to write a monthly column. 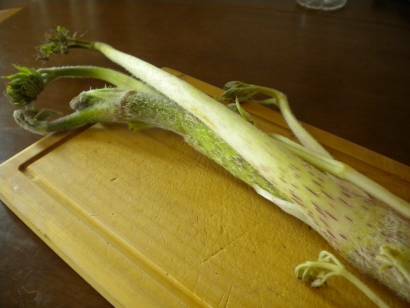 Udo (Aralia cordata) is one of the stranger vegetables to be met in a Japanese market. It's length alone – sometimes half a meter or more – can be intimidating. Add pale hairy skin with a blush of maroon near the center growth joint, a curl of leaves resembling a withered hand, and you have a decidedly freakish-looking vegetable. Yet, those that pass this wild vegetable by for more sedate produce such as the carrot miss a seasonal delicacy with delightful flavor and versatility. Udo is one of the few vegetables eaten raw in Japan, where it shows off a sweet-spicy flavor reminiscent of ginseng with a texture not unlike a good firm apple. It can also be boiled with miso and pork, served by itself with a dollop of miso, or simply massaged with salt and left to rest a bit before eating, after the fashion of tsukemono (traditional Japanese pickles). Others simply grate it into fresh salads for a seasonal zest. The Japanese enjoy udo roots, its most popular and well-known form, until shortly before summer officially begins. A perennial edible in the vast and varied sansai (mountain vegetable) family, udo is counted as a welcome sign of warmer days to come. Found along mountain stream banks where it thrives in dappled sunlight and moist soil, udo reaches a height of 2-3 meters even before sporting a spiked bloom consisting of hundreds of small white flowers. Today, people return to rural family lands to forage as their ancestors did for sansai, including yama udo (mountain udo). When the first leaves are discovered emerging and unfurling, foragers gently dig away the surrounding soil to reveal the signature white roots. Later in the summer, they will return to selectively harvest young leaves and flower buds from remaining plants to make a lovely tempura companion to cold soba or udon. Valued as a perennial edible, udo is also used in traditional Chinese medicine. Powder from the dried roots is prescribed to alleviate fevers and reduce muscle and joint pains. The Ainu, Hokkaido's native people, made a poultice of this mountain herb to help heal bruises. While udo began in the wild, what most people see at the supermarket or farmers market is most likely from a farmer's field. Planted in 'caves' or holes about three meters deep with a thick tarp flung over the top to keep out light, domesticated udo grows in complete darkness until harvest. These months of darkness mimic the deep forest soil of its natural home and keep the root from photosynthesizing and turning green. The difference between the two udos is slight but distinct with yama udo possessing the stronger flavor. Domestic or wild, both are equally loved for their distinctive crunch and flavor. Recipes vary from family to family, but the following is a regular favorite at home or in the izakaya. **Pinches of karashi (spicy yellow Japanese mustard) can be added as taste buds desire. Peel the udo and cut off the leaves and side shoots. Cut into sticks about four centimeters long. Set aside to soak in a bowl of water. Mix miso, mirin, and sake together in a bowl thoroughly. Serve udo cold with dressing on the side. Note: Stephen Barstow also mention this lovely edible in his most amazing book, Around the World in 80 Plants. Fascinating article, thanks Joan. It looks like I'll have to visit Japan to sample it - there's no way I can mimic the conditions it prefers! Glad you liked it! Well, let me know when you venture over. I'll make sure you get a taste. It's worth the trip!